Story: In George Milner's second detective novel the private investigator, Ronald Anglesea, is called on to inquire into the disappearance of the valuable Manders rubies from Deed House, near the north-west coast of Scotland. But one of the guests has vanished, as well as the rubies; to Anglesea it becomes a case of murder. 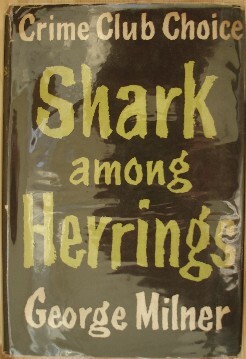 Before it is finished he is to see murder committed in front of his own eyes, and in sight of other witnesses, but it still remains a problem for the police, Anglesea and, we believe the reader, to decide who was the Shark Among Herrings.